Q: We’re excited to talk with you about your new book which explores Bonhoeffer’s often neglected dissertation, Sanctorum Communio. This book grew out of your own doctoral dissertation at the University of Notre Dame. What initially drew you to Sanctorum Communio as a topic for your research, and why has it remained significant to you over the years? MM: Thank you. I’m excited to talk with you. As you note, my book grew out of a doctoral dissertation. I’d initially planned an overly ambitious project exploring Bonhoeffer’s complex relationship to Hegel and idealism. I had intended to trace this relationship through a number of Bonhoeffer’s major texts. After about a year and a half of work, I realized I was still only working on Sanctorum Communio... Hence the new project became a more modest attempt to simply figure out what Bonhoeffer was doing in this early text. My book then became a further (hopefully clearer) attempt to present Bonhoeffer’s early ecclesiology and make the case for its ongoing significance. In terms of what drew me to Sanctorum Communio in the first placeand why it has remained so significant... Hmm... Prior to undertaking doctoral studies, I had been involved in an intentional Christian community for several years in New Zealand. I think this involvement continually raised the question of how we understand and attend to Christian communities/ churches as places that witness to God, even as they remain flawed and limited on their own terms. As I try to show in my book, Bonhoeffer provides a rich account of how we might hold these two aspects of the church together. At least on some level, this technical book on Sanctorum Communio is an attempt to wrestle through how we understand the church as the place of God’s revelation, while still recognizing its limits and failures. Q: It’s now close to ninety years since the original publication of Sanctorum Communio, and yet, it remains one of Bonhoeffer’s most neglected texts. You note how there has only been one other monograph written on Bonhoeffer’s dissertation, despite the fact that Sanctorum Communio is perhaps the closest Bonhoeffer ever came to writing a systematic theology. What originally motivated this neglect, and why do you think it has persisted throughout four generations of Bonhoeffer scholarship? MM: I suspect there are a number of reasons behind Sanctorum Communio’s neglect. First, Bonhoeffer wrote Sanctorum Communio early in his life and in a relatively short space of time; it thus lacks the clarity and precision of much of his later writing. Second, many of the figures and sources that he is engaging and invoking are no longer familiar to us. Third, I think there are just ambiguities in the text as it stands. Or at least it is often unclear how some of the claims and discussions are related to others. All of this combined makes Sanctorum Communio a difficult text to read and interpret. I worked on my dissertation and book for around six or seven years, but I’m constantly finding passages in Sanctorum Communio that I’m unsure about. Here I should also mention here that my book would not have been possible without the careful work of the DBW and DBWE editors and translators (especially Clifford Green and Joachim von Soosten). This often allowed me to identify Bonhoeffer’s sources and to track many of the decisions underlying Sanctorum Communio. My book is also reliant on material from Bonhoeffer’s original dissertation (SC-A), which the editors reincorporated into both DBW 1 and DBWE 1. This original material often displays Bonhoeffer’s thinking in ways that are less evident in the published version of the dissertation (SC-B). You mention a passing comment that I make in my book about Sanctorum Communio being the ‘closest Bonhoeffer ever came to writing a systematic theology.’ I was making a point that some of Bonhoeffer’s readers have focused on his Christology without always sufficiently attending to how this relates to and is coordinated with other aspects of his theology. And I suggested that attending to Sanctorum Communio may help a little to mitigate this tendency (i.e. in that it has distinct but related treatments of creation, sin, the church, eschatology, etc.). Q: You begin your book by outlining two major intellectual influences on Bonhoeffer’s early theology – Karl Barth and Ernst Troeltsch. How do Barth and Troeltsch inform Bonhoeffer’s argument in Sanctorum Communio? Perhaps more importantly, how does Bonhoeffer move beyond these two thinkers and what is entailed in the ‘third standpoint’ he lays out in Sanctorum Communio? MM: My opening chapter frames Bonhoeffer’s first dissertation by showing how he is broadly responding to these two giants and the theological options they represent. To be clear, Bonhoeffer himself doesn’t always have Troeltsch and Barth in view (and refers to them only occasionally in Sanctorum Communio). But my assumption is that these figures would be more familiar to contemporary readers. Accordingly, I contrast Bonhoeffer’s own pursuit of an ecclesial approach to theology (his ‘third standpoint’) with both Troeltsch’s commitment to a thoroughgoing historicism and Barth’s early dialectical theology. For Bonhoeffer, the work of theology always proceeds from the concrete church: ‘the empirical church is the presupposition for theology’, as he puts it in some later lectures.Moreover, I suggest how this ecclesial turn allows him to still incorporate important elements of both Troeltsch’s and Barth’s approaches, albeit while reframing them. Q: Woven like a melody line throughout your book is the claim that Bonhoeffer’s ecclesiology is organized around a theological dialectic of creation, sin, and reconciliation. Can you explain and how this dialectic operates and the ways it is so central to Bonhoeffer’s understanding of the church? My book tries to take this claim seriously, which means reading Bonhoeffer’s ecclesiology or concept of church by continually attending to its ‘inner history’ or ‘split’. Following Bonhoeffer, this involves developing robust accounts or doctrines of the primal state (i.e. creation), the state of sin, and reconciliation in Christ. This is necessary for explicating what the church concretely is. Any attempt to understand the church apart from this dialectic and these states, for Bonhoeffer, remains abstract or ‘idealist’. Q: Bonhoeffer develops his account of the church in Sanctorum Communio through a complex theological engagement with social theory. In your book you argue that Bonhoeffer’s use of social theory tends to be misinterpreted. How does Bonhoeffer uniquely use social theory in his dissertation? Moreover, how is this use governed by the dialectic of creation, sin, and reconciliation? MM: Most scholars have been critical of Bonhoeffer’s engagement with social theory in the early chapters of Sanctorum Communio. In an early and influential essay, for example, Peter Berger criticized Bonhoeffer’s decision to draw on formal sociology (i.e. Simmel, et al.) rather than historical sociology (i.e. Weber, et al). According to Berger, this decision reflected Bonhoeffer’s own largely uncritical, and in hindsight limited, preference for the prevalentschool of his time. On the one hand, I try to show that there are theological commitments underlying Bonhoeffer’s preference for formal sociology. On the other hand, I suggest that he is not simply adopting and using insights and concepts from formal sociology; rather, he is reworking them on the basis of deeper theological commitments. As you note, I suggest that he does this by engaging social theory and formal sociology on the basis of his dialectic of creation, sin and reconciliation. Here is perhaps helpful to take another quote from Sanctorum Communio: ‘[T]he concepts of person and community... are understood only within an intrinsically broken history, as conveyed in the concepts of primal state, sin, and reconciliation.’ Taking my cue from quotes like this one, I argue that Bonhoeffer does not have stable or univocal concepts of ‘person’ or ‘community’ running throughout Sanctorum Communio. Rather, he is constantly reworking and rethinking such social-philosophical concepts in and across his treatments of creation, sin, and reconciliation. Ultimately, I suggest (in my conclusion) that this results in a theological engagement with social theory that is both more appreciative and more critical than that of someone like John Milbank. Q: One of the more well know aspects of Sanctorum Communio is Bonhoeffer’s development of a Christian concept of person as an alternative to idealism’s reasoning subject. In fact, many scholars read this concept as foundational to the dissertation, and central to much of Bonhoeffer’s later work. However, you argue that Bonhoeffer’s concept of person has a more limited role in Sanctorum Communio than previously assumed. What specific role does this concept have in Sanctorum Communio? MM: That’s right. I argue that Bonhoeffer’s ‘Christian concept of the person’ in the second chapter of Sanctorum Communio is not really the ‘foundation’ for the whole dissertation. Rather, my claim is that Bonhoeffer is using this concept to present the real situation and standing of the human being before God after the fall. In other words, what he calls ‘the Christian concept of person’ is tied closely to how God encounters and claims the human being in her postlapsarian situation. And this means this concept has a more delimited and specific (albeit still crucial) role in his early theology than some others have suggested. What is at stake with this? Those who have read this concept or the second chapter of Sanctorum Communio as a foundation have tended to suggest that he is developing a ‘relational anthropology’ or ‘concept of person’. While this is certainly true, my concern is that it just doesn’t recognize how much this anthropology is tied to the wider theology and structure of Bonhoeffer’s dissertation. My own interest is thus in showing how this concept is just one part of a richer and more complex dogmatic and ecclesial theology. Q: One longstanding criticism of Sanctorum Communio has been that it is insufficiently Christological. Scholars have argued that Bonhoeffer collapses Christ into the existing church in ways that place the church beyond criticism. What do you make of this criticism? MM: In one of my chapters I try to demonstrate that Bonhoeffer has a more robust and viable Christology in Sanctorum Communio than many readers have recognized. Even while Bonhoeffer closely identifies the Christ with the existing church (i.e. in formulations such as ‘Christ existing as community’), he is still careful to insist that Christ remains ‘Lord of the church-community.’ In other words, he is careful never to ‘completely identify’ Christ with the church, in the way that some critics have suggested. In particular, I indicate that he maintains this position through a careful separation of the work of Christ (establishing) and of the Holy Spirit (actualizing) with respect to the church. Furthermore, I suggest that two of Bonhoeffer’s well-known theological formulations—‘Christ existing as community’ and ‘vicarious representative action’—are both crucial to how he understands the relationship between Christ and the concrete church. Q: In Sanctorum Communio Bonhoeffer presents two of his more well-known theological formulations: ‘vicarious representative action’ (Stellvertretung) and ‘Christ existing as church-community’ (Christus als Gemeinde existierend). How does Bonhoeffer draw upon (his Christian reworking) of social theory to develop these terms? MM: One of my claims in this book is that many scholars read and treat these formulations in isolation from the wider structure and theology of Sanctorum Communio. By contrast, I again try and demonstrate how these formulations are embedded in, and thus fully explicable only in terms of, a wider structure and argument. 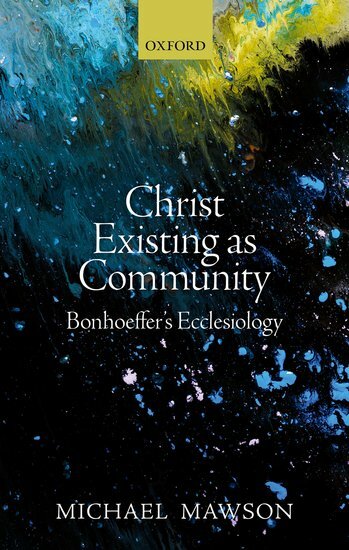 For example, Bonhoeffer himself explains ‘Christ existing as community’ using the concept of ‘collective person’: ‘The church community as a collective personality . . . can be called Christ,’ as he puts it. This means that properly understanding this formulation requires attending to the different ways that Bonhoeffer uses the concept of collective person in earlier parts of Sanctorum Communio. More specifically, it requires attending to how ‘Christ as collective person’ differs both from collective persons in the primal state and from the collective person of Adam (i.e. humanity after the fall). The concise formulation ‘Christ existing as community’ has all of this in play. Q: You make it clear in the book that you are assessing Sanctorum Communioon its own terms and, as such, give little attention to the development of Bonhoeffer’s theology. That said, if you had to write sequel to your book where would you begin? In other words, what are some of the ways that Bonhoeffer’s ecclesiology develops or transforms over time? Is the dialectic you discern in Sanctorum Communio present in Bonhoeffer’s later thought as well? MM: Ha! It has just taken me around six or seven years to write a book about a dissertation that Bonhoeffer himself wrote in the space of months. So I guess one option for my sequel(s) would be just to continue working slowly through his corpus. This would mean that I should have a book on Act and Being finished by around 2025, and I might just make it to Creation and Fall by the time I am due to retire. In terms of Bonhoeffer’s ecclesiology, I tend to read Sanctorum Communio as basically consistent with Bonhoeffer’s later discussions of the church. I recently taught Life Together in an undergraduate class, and was continually struck by how many of the basic claims and insights were already present in Sanctorum Communio. In terms of what I have called the ‘theological dialectic’ (i.e. creation, sin, reconciliation), this exact language doesn’t really appear after Sanctorum Communio. Rather, Bonhoeffer uses different language to make the same basic point. In Act and Being, he presents the inner dialectic or fragmentation of the church using the language of ‘being in Christ’ and ‘being in Adam’. And in Ethics,he writes of the church as ‘the ‘human being who has become human, has been judged, and has been awakened to new life in Christ.’ If I were to write a sequel, then, I would hope to demonstrate how this same dialectic or pattern remains at the heart of Bonhoeffer’s theology and ecclesiology. Q: Toward the end of the book you discuss the ongoing significance Sanctorum Communiohas for contemporary debates in theology. You note that Bonhoeffer’s approach in Sanctorum Communio comes into proximity to scholars who advocate for and practice a type of theological ethnography. At first blush this makes a lot of sense, considering Bonhoeffer’s own lived experience was so central to his theological work. However, you have some concerns about this approach to ecclesial theology. How would you suggest scholars rework concepts like ethnography in order to include them in theological analysis? MM: In the conclusion of my book, I briefly compare Bonhoeffer’s approach to the church with four more recent theological approaches: those of Stanley Hauerwas, John Webster, John Milbank, and the ecclesiology and ethnography movement. This last movement encompasses a range of scholars who have been advocating for ethnographic practices as a way of developing more concrete ecclesiologies. While I am deeply sympathetic to this movement, I suggest that some of these scholars proceed in ways that can suggest that ethnographic practices per se provide access to the concrete church. Following Bonhoeffer, a more genuinely theological (and thus more concrete) approach requires attending to the church in its concrete form as simultaneously created, sinful, and reconciled in Christ. I thus briefly speculate that a theological use of ethnography needs to entail a more thorough reworking (and internal fragmentation) of ethnographic practices and description. Q: What are you working on now that Christ Existing as Community has been published? MM: My main focus at the moment is on completing the Oxford Handbook of Dietrich Bonhoeffer, which I am co-editing with my colleague Phil Ziegler. We have collected together some excellent essays by established and emerging scholars, and we hope to be able to make these available to readers very soon. I’ve also begun doing some research and writing in the area of ageing and ethics. In particular, I’m interested in how theology and phenomenology can help us to better attend to lived-experiences and the messiness of the final stages of life, and in how this in turn might help us to reframe some ways we think and talk about bioethics. I’ve found myself drawing on Bonhoeffer a little for this work, as well as on Barth, Heidegger, Maurice Merleau-Ponty and some more recent scholars. Thank you for reading my book so carefully and for putting together such focused and insightful questions. Michael Mawson is a senior lecturer in Theological Ethics at the University of Aberdeen.